The word happyokai, according to my understanding, could be used for many things, as long as it means to launch yourself for something, or to introduce yourself to people in the same area. More to let people know that you are there. Anyways, I managed to finally have my happyokai. Proud of myself to be one of the earliest to be given the opportunity, albeit it was a local conference. Provided that I am now in Nihon, when I said local, all language used was Nihongo. I did not benefit much from the whole program due to language barrier. Sedikit kesal di situ. 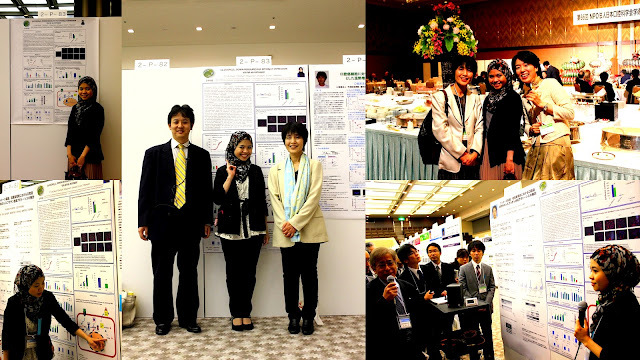 My happyokai:) My first time exposing myself to the senior researchers/scientist of the same area. Totally new experience for me doing the Japanese style presentation. Tanoshikatta. What I want to share with you today is about one plenary talk session given by Prof. Gordon Sato. Global warming was the least I would think of to be hearing at a 'stomatology' conference. So, Prof. Sato is now 84 year old. His health was not at the peak. He was easily got tired by walking from one point to another. However, his brain was so much well functioning. His talk was introduced by a video of him when he was in Africa. He was there, initiating and even sponsoring the project of planting thousand and thousands of mangrove tree. Since he is specialized in hormones-related study, he used his knowledge to develop a method to easily grow mangrove in a remote area of Africa in which most of the inhabitants are poor. His idea is to help these people providing the source of food for themselves. You must be wondering how mangrove tree could help them providing? These people depend a lot on animals like goat and cows as the source for dairy, transportation, etc. However, before Prof. Sato arrived, they had a hard time feeding themselves, let alone the animals. So, the idea of his project is to help them providing the the food to animal which later get the cycle going. At the end of the video, his words had touched me deep. He was saying, we learn science, not just for ourselves. We learn it to give back to the world. To make the world to a better place. People who learn science must be able/ try to see things in a wider vision, but all must at the direction of helping our nation. He said, look at him. He is now 84 year old. He was already too old when he realized that. He is too old to act more than what he did. He remembered the days when he was so ambitious. Because he grew up in poor environment, made him so ambitious. He wanted to learn science to help other poor people. So, I think this is a good morale value to teach our children. We cannot just ask them the 'job' they wanted to do when they grow up. We should ask who they want to be when the time comes. So, one day, they can feel a sense of completion. Sense of satisfaction. InshaAllah, with consistent reminder from us, the parents.